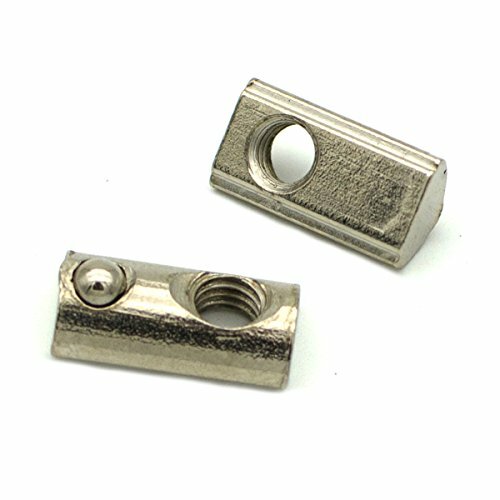 This nut has a built-in steel ball that is elastic, when you roll in the t nut in a aluminum extrusion, the spring ball keep the nut stay in position, effectively prevent the t nut from slipping down when you roll in it the vertical aluminum profile. You can install the t nut on the profile at any angle. Compatible with 20 series, 20 x 20mm, 2020, 2040, 2060, 2080 metric aluminum extrusions. Roll in T nut, an elastic steel ball is built in, easier to install the T nut in a vertical aluminum extrusions. Suitable for most of european 20 series T Slot aluminum extrusions. NOTE: This nut can not compatible with inch system 20 series aluminum profiles. Before order plase compare the thickness of the nut and slot height of your extrusions, the width of the nut step width and the notch width of your aluminum extrusions. If you have any questions about this product by TOPINSTOCK, contact us by completing and submitting the form below. If you are looking for a specif part number, please include it with your message.